Born to eternal life on April 7, 2018 at the age of 99. Preceded in death by her loving husband David. Loving mother of Frederick (Jeanne) Parish; Robert (Ann) Parish, Nancy Beck, Dr. Mary (Thomas) Gavinski and Paul (Kathy) Parish. Beloved Grandma of 17 grandchildren and 15 great grandchildren. Further survived by many nieces, nephews and cousins. Alice was born in Stevens Point to John and Rose Laszewski. As a small child she moved with her family to Milwaukee, WI. She graduated from Riverside High School. Alice moved back to Stevens Point when she married David Parish at St. Stanislaus Church in 1939. David passed away January 30th, 2002. Alice was a homemaker most of her married life. In later life she was employed with the Stevens Point School system in food services. Alice was a long time active member of St. Joseph Church. She belonged to St. Anne’s Society of St. Joseph Church and Knights of Columbus auxiliary. 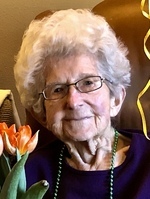 Along with her husband, Alice was a long time supporter of Stevens Point Catholic Schools. Later in life, Alice was a volunteer for Meals on Wheels and at St. Michaels Hospital. Alice was a fun loving person who very much enjoyed dancing, sewing, bridge, reading and spending time with her family. Her family will dearly miss her but her famous cookies will live on. Special thanks to the outstanding staff at St. Camillus, Milwaukee, WI- Assisted Living and Memory Care units for the wonderful care they gave Alice while she resided there. A Mass of Christian Burial for Alice will be held at 11:00 AM on Thursday April 12, 2018 at St. Joseph Catholic Church. Rev. Jerzy Rebacz will officiate. Friends and family will gather to share memories from 10:00 am until the time of services at the church. Burial will be in the St. Joseph Cemetery.